Today a year ago, my sister became a widow, when my awesome brother-in-law died after a 3 week bout with peritoneal mesothelioma. Needless to say I was thinking about him today. My brother-in-law was loving and kind. He had an amazing generosity of spirit. My last message from him was around December 20, 2010. He told me to save him some Christmas cookies. It was at that point last year that I started burning batches of cookies by accident. I was also thinking of my late father the past couple of days. It started when I was looking through my books to pull out the Christmas ones a little note my father had written me as a gift enclosure fluttered to the floor. Seeing his handwriting I was instant puddle, just add tears. My father and my brother-in-law loved Christmas. My father took forever to decorate the tree. It was a total study in symmetry and precision – the lights were perfectly placed, nary an ornament out-of-place. 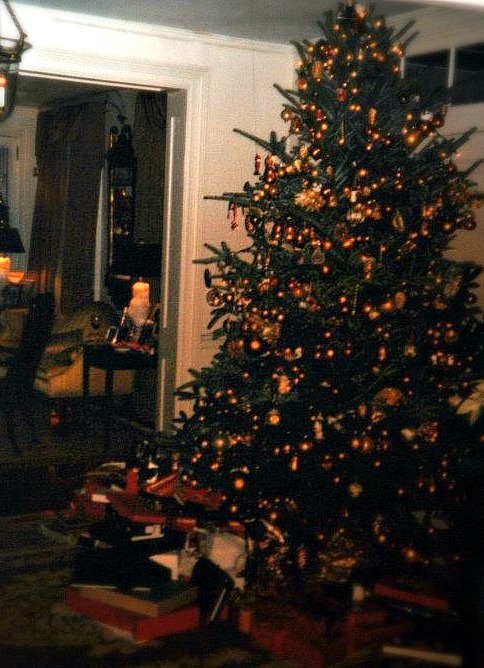 His trees were gorgeous and he won awards when we were little for his door sprays when we lived in Society Hill. I can still see both of them in my mind’s eye and hear their voices in my head. These are the ghosts of Christmas past whom I miss. Both were men who loved their families and they were part of my inspiration to get through breast cancer strong and in a positive frame of mind. I will also note how proud I am of my sister. She has shown the most remarkable strength and bravery and love in this past year and I think she is amazing. Anyway, I expect Christmas this year will hold many layers for me. I have a lot to be thankful and grateful for. The top of that list is I know I am loved, and that is one of the best gifts human beings can give to one and other. This entry was posted in Uncategorized and tagged breast cancer, christmas, ghost of christmas past, Laura Ingalls Wilder, life, tamoxifen. Bookmark the permalink.